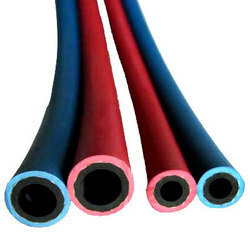 Manufacturer of a wide range of products which include welding hoses. Be used to convey oxygen and acetylene in the shipbuilding and machinery industry in the bad environment. The appearance of hose is bright, the body is soft and light which hardly distorted under pressure. It has good property of bending anti-aging and durability. The reinforcement with high strength will be applicable to the environment of shipbuilding. The burst pressure is three times or higher than the working pressure. Used to convey oxygen and acetylene for all kinds of metal-welding and cutting machines. Looking for welding hoses ?